“Caution, Terrain” would have sounded in the cockpit fully seven seconds before the helicopter struck trees and ploughed into the ground, killing four persons aboard and adding injuries to the surviving of two patients being evacuated for medical treatment. But the Maryland State Police (MSP) medical evacuation helicopter was not equipped with TAWS (Terrain Awareness Warning System), which would have sounded three alerts, in increasingly forceful language for the pilot to take action. The absence of TAWS on this helicopter, while three other MPS helicopters were so equipped, was one of many safety deficiencies surrounding the flight. Numerous corrective actions have been taken since the 27 September 2008 disaster, raising the obvious question: why must these initiatives always seem to be implemented after, not before, lives are lost? The answer is quite direct: a mixture of ignorance and complacency. Of the two factors, complacency is the greatest threat to aviation safety. If one is complacent, knowledge of the availability of TAWS for helicopters is uncertain. Other practices, thought to be prudent, do not seem so in the hard-eyed scrutiny following a fatal accident. The National Transportation Safety Board (NTSB) recently completed its investigation into the nighttime crash on bad weather of the MPS helicopter, known as “Trooper 2,” which was lost just a few miles from its intended landing at Andrews AFB after the pilot decided that landing at Prince George’s Hospital (PGH) was not prudent due to deteriorating weather. 1:49:12 a.m. local time Trooper 2 Potomac approach, Trooper 2, we tried to make a medevac up at PG hospital and we’re about 7 miles northwest of Andrews, like to climb to 2,000 feet and shoot an approach to runway 1L at Andrews. 1:49:44 Trooper 2 No sir, I want to shoot the approach at Andrews. 1:50:16 PCT 360 heading vectors to the ILS 19R just one approach into Andrews or you coming back out for another? 1:50:28 Trooper 2 No sir, I’ve got patients on board, I’m trying to get them down. 1:53:50 PCT Trooper 2, mile and a half from the final approach fix turn right heading 1 uh 70 maintain 2000 until you’re established on the localizer cleared ILS runway 1R approach into Andrews. 1:55:30 Andrews (ADW) Trooper 2, roger runway 19 (unintelligible) cleared for the option wind 090 at 5. 1:55:35 Trooper 2 Trooper 2, roger, we’ll be landing at the base of the tower. 1:55:38 ADW OK you can break it off your discretion for the ramp. 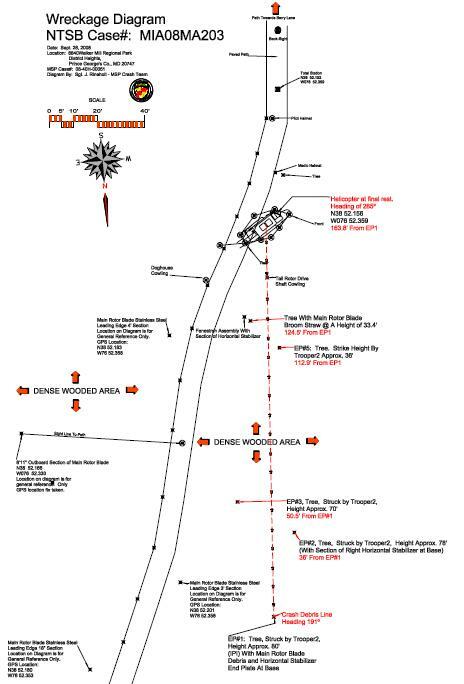 Just use caution for the closure of (taxiway) whiskey just abeam the tower (unintelligible) rows it looks like 2 and 3. 1:56:44 Trooper 2 Andrews tower, Trooper 2, I’m not picking up the glideslope. 1:56:50 ADW Trooper 2, roger, it’s showing green on the panel but you’re the only aircraft we’ve had in a long time so I don’t really know if it’s working or not. 1:56:59 Trooper 2 OK could I get an ASR (airport surveillance radar) approach in? 1:57:4 ADW There isn’t anybody to do that, I’m not current on that, I can’t do it. Investigators believe Bunker’s request for an ASR approach was for someone to talk him down. An ASR approach is an obsolescent technology, and the Andrews’ controller’s lack of currency is not surprising. Even though Bunker was on the glide slope, the worsening visibility (low clouds, fog), threatened to push him from VFR (visual flight rules) into IFR (instrument flight rules) conditions. He had had only about 1.9 hours of actual instrument time in the previous two years, and the Federal Aviation Administration (FAA) has no definition of instrument night proficiency. The FAA does not specify the number of instrument approaches required for proficiency. Thus, even though Bunker was an IMC (instrument meteorological conditions) qualified flight instructor, he was not getting support from air traffic controllers. He descended below the glide slope, in an apparent effort to get under the clouds (a practice known as “scud running”). The helicopter hit treetops less than 3 miles from the runway threshold. The aircraft was not equipped with TAWS, which would have alerted Bunker to the deviation from glideslope and the rising ground beneath. MSP had equipped three of their helicopters operating in hilly terrain in Cumberland and Frederick, with TAWS; what they did not pursue was the fact that most controlled flight into terrain (CFIT) accidents occur over flat ground, usually on approach to landing. They tried to save money while leaving most of the helicopters vulnerable to the primary CFIT threat. At NTSB request, Honeywell engineers were called in. Honeywell is a primary avionics manufacturer of TAWS technology. The Honeywell model for helicopters is known as EGPWS (enhanced ground proximity warning system) Mark 22. Honeywell engineers performed a simulation of the accident flight. The simulation was based on the assumptions of a 50-foot look-ahead function and that the aircraft was not auto-rotating down. 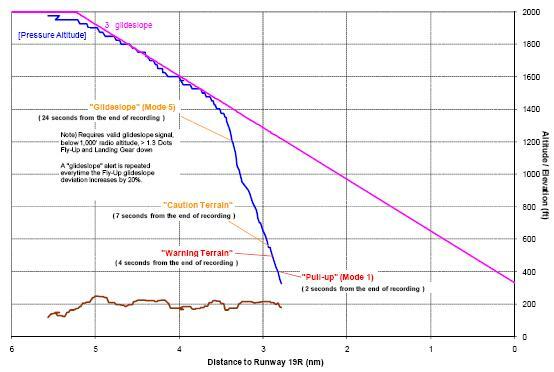 — Their equipment, if on the accident helicopter, would have alerted the pilot fully 24 seconds before impact that he had deviated from the glideslope. — Four seconds before impact, “Warning, Terrain” would have sounded. — Two seconds before impact, “Pull Up” would have been annunciated. To be sure, we cannot say for certain that TAWS would have prevented the crash. But given that this tragedy involved a single pilot, out in darkness and fog, and “required to compensate for poor ATC services” (according to the NTSB’s resident ATC expert), TAWS would have provided plenty of warnings in the cockpit that the helicopter was too low. Although in line with the runway, and just a few miles away, it took searchers to hours to find the down helicopter. They were attracted by the screams of the sole survivor, patient Jordan Wells, hurled from the wreck and soaked in fuel. Now 20, Wells has undergone 20 surgeries to repair damage from the combined effects of the automobile collision and the helicopter crash. It was later determined that transport by helicopter – vice ground ambulance – would have saved less than 5 minutes. Bunker had not conducted anything in the way of a formal or structured risk assessment prior to the flight. Chairman Deborah Hersman said this is simply “mind boggling” in the dynamic operating environment encountered. A written risk assessment that can be used and archived should have been employed, she maintained. Since the accident, the MSP helicopters conduct 40% fewer medical evacuations. “A trauma center doctor now evaluates the condition of each patient being considered for helicopter evacuation,” she recounted. The mother of patient Ashley Younger, 17, who died in the crash, approached Hersman after the hearing, asking why safety features were not mandated. Hersman explained that the Safety Board makes recommendations and that it is up to Congress or the FAA to make rules. Mrs. Younger began to cry. The NTSB issued nine recommendations and reiterated three others issued previously, including one to require TAWS on medical helicopters (for particulars, see www.ntsb.gov/Publictn/2009/AAR0907.htm). 1. Increased weather minimums to 1,000/3 for night operations [1,000 vertical/3 miles horizontal visibility]; 800/3 for day operations (pre-accident was 800/3 night; 600/2 day). 2. He requested a template for Part 135 operations from the private (Part 135) operators, to decide if MSP operations should be restructured to become more aligned with Part 135 [the accident flight was operating under the less demanding Part 91 rules]. 3. Stricter MEL [minimum equipment list] operations (especially for autopilot or instrumentation deficiencies). 4. Grounded all helicopters in the fleet until the instrumentation could be checked (particularly glideslope functions). 5. All pilots were grounded after the accident until they performed an instrument checkride. Major McAndrew was asked about Terrain Awareness and Warning Systems (TAWS) and night vision goggles (NVGs) in MSP helicopters. He responded that 3 of the 12 helicopters have TAWS … All new helicopers that are purchased by MSP will have TAWS … Currently, MSP helicopters are not compatible with NVGs. Mr. Gartland was asked how pilot pay was at MSP. He reported it was “pretty sad,” and the reason pilots stayed was due to their dedication to the mission … (the) quality of new hires had deteriorated because of pay issues. Pilots could not afford to live in the area. Currently, pilots do not complete a formal risk assessment (paperwork), as the Command does not believe it is the best method for evaluating risk. However, they are working to create a beneficial tool now. At the time of the accident, there was an assessment tool in the SOP, however, it was not used by pilots. Lt. Kerr was asked about the quality of maintenance at MSP. He responded that he has “no reservation about flying in any aircraft.” He did not mention it was difficult to produce paperwork for every issue, and MSP is working to become better at that. Despite lacking paperwork, maintenance is always performed completely. According to Mr. Corolla, the MSP turnover rate was “horrendous.” After 2000, the MSP has had a “terrible time retaining pilots” … (and) maintenance had problems with turnover. PG County Hospital was a 48-minute drive time, and more than a 30-minute drive justified the use of helicopter transport. Thirty minutes is considered a decent time for a patient to no longer compensate for internal injury and show a drop in vital signs. With regard to federal oversight, Mr. Holt thought the FAA was supposed to oversee the medevac part of the MSP operation (those missions flown as Part 91 flights). The law enforcement missions were conducted as “public use” flights, and Mr. Holt thought there was no FAA oversight for those missions. Mr. Holt never saw the FAA at the MSP bases. The MSP program valued loyalty over truth. Many people bared their souls for the audit report but their criticisms never appeared. The Safety Office program was gutless. It became a shell after … 2006 … The number of ASR’s [aviation safety reports] declined. The Safety Office settled the routine, mundane issues of the ASR reports but real safety concerns (were) not broached because of fears of recriminations. He believed that the MSP program had shaky maintenance practices. It left pilot writeups unaddressed until scheduled maintenance checks, so pilots routinely flew aircraft with writeups into the grace period on the checks. There was no process in place for tool control. The Director of the Maintenance Department was a trooper paramedic without a maintenance background. The FAA maintenance manual was not current. Wiring diagrams were worked from manufacturer preliminary, rather than final, diagrams. These deficiencies are important because, as a pilot, you need assurances that maintenance is good. He believed that the State Police should not run this program. Police need aviation. Street officers loved this program. But the program could not conduct medevac, homeland security, and search and rescue efforts without suffering. As a policymaker, Sen. Astle wanted a system that was safe. The General Assembly would soon have a debate about the future of this program, and the NTSB report would be a foundation of the discussion.